The Anton Bauer Digital 150 Gold Mount Battery (14.4V, 156 Wh), along with the rest of the Digital Battery Series, represents a major makeover for Anton Bauer, featuring a redesign in several aspects over previous series. The result is a long-lasting, sleek and ergonomic, smart, and safe series of batteries, projected for 1000 charge/discharge cycles. The Digital 150 runs on lithium-ion Sanyo cells which Anton Bauer has found to be highly reliable for them in the past. One of the major changes is a reconstruction of the honeycomb interior, built very spacious and housing the cells physically separated from one another, each individually wrapped in its own plastic case and isolated from the others. This ensures that any potential damage to one cell will have no effect on the others, huge for safety. The additional space in the honeycomb also serves to allow more airflow between the cells, effecting more heat dissipation, which will keep the cells cooler and protect them from aging faster. The Digital Battery Series is compatible with the concurrently released Performance Series of chargers and with all previous Anton Bauer chargers. Used with any of these chargers, via a feature that has become common to the Anton Bauer name, the Digital 150 exchanges certain digital data with the charger that allows the selection of the best charge routine possible for the battery's cell chemistry, maximizing overall life. 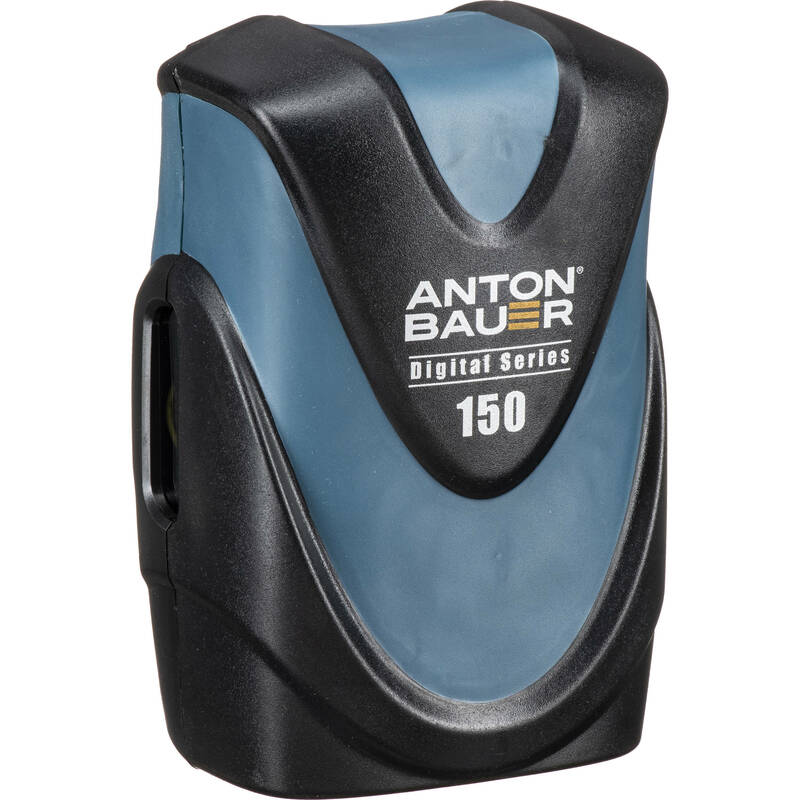 Via another familiar Anton Bauer feature, the Digital 150 applies a continuous and constant calibration that enables it to provide more and more accurate capacity and run-time calculations over the life of the battery. Run-time is usefully reported in hours and minutes on an easy-to-read LCD when power is being drawn, and as a percentage value when no load is attached. The reporting in hours and minutes will only get more and more precise with each use as a result of the constant calibration feature. Box Dimensions (LxWxH) 9.95 x 7.7 x 7.2"
Digital 150 Gold Mount Battery (14.4V, 156 Wh) is rated 4.5 out of 5 by 8. Rated 4 out of 5 by michael from Good battery, bad exterior design We use the flat surfaces of batteries to connect mic receivers and other things- sometimes by velcro and others using clamps or whatever... and this makes that impossible! Consider adding some sort of connectors or open loops so we can fasten things to the batteries! Rated 4 out of 5 by Ryan E. from Anton Bauer Quality Not thrilled with the design of this brick, but the price is pretty solid for a 156wh battery with the Anton Bauer name on it. when fully charged the display says it will run my HPX-300 for 9:45. That's some impressive run time. Rated 4 out of 5 by Alan F. from New Anton Bauer Digital 150 Using this new battery on a Varicam 2700. It is a battery hog, and this battery holds it's own. I like the new look, but wish I would have known I could of gotten black on black colors. Rated 5 out of 5 by remotemark from Great Quality Several years ago, I was concerned how The Vitec Group's acquisition of the Anton Bauer brand would impact the quality of their products, but I am quite impressed with the build quality of these redesigned Gold Mount units. Very lightweight but solidly constructed. Best of all, my Quad charger still works with the new batteries (as long as I upgrade the firmware chip). Rated 4 out of 5 by Anonymous from Goofy Looking Battery Goofy looking battery but seems to work very well. I am using my Titan and Quad battery chargers. The Titan works great and my Quad will charge it fine and it reads the data from the battery but it thinks its a Dionic 90. (??) Seems to work though. I will be buying more as I replace my older AB batteries. Rated 5 out of 5 by Anonymous from Great purchase Expands the continuous use of my camera during long shoots. So, is there a valid and scientific reason for me to pick this over the Cine 150? Does this pass inspection for air travel? Can i charge this battery with an old ab Tandem charger? Answered by: GREGG M G.
Does it come in any other colors than blue? As far as I know, the 150 only comes in blue. They have a 190 that comes in black and gray which is more power, but you cant fly with it. Can I charge this battery through the P tap port? I can charge Switronix, just curious if I can with this battery. Thank you in advance. No ,I don't believe you can charge Battery by way of the D tap port on the Battery. Could I power a laptop with this? Many thanks.